The EyeLuv Lashes system adds volume, length and lift to your own natural lashes for an amazing look. Using the latest technology your short or long lashes can be transformed using cleverly designed silicon pads the treatment achieves a natural looking lift and shape, giving the illusion of longer and thicker lashes. Advantages of the quick and easy system include lasting up to 6 weeks, an all natural, low maintenance treatment with no adhesives or mascara required. Add volume and length instantly by selecting from the highest quality range of professional eyelash extensions available. 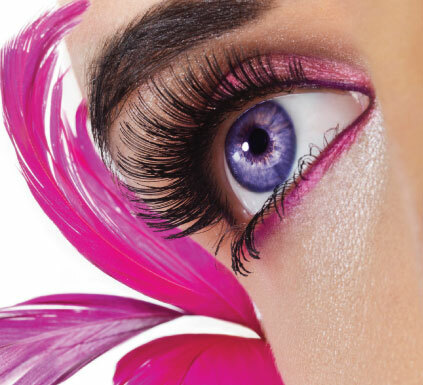 Our qualified technicians will help you choose from Individual Eyelash Extension, Express Lashes or Cluster Lashes to give you that natural look with added red carpet style. All of our lashes are precision made using an advanced polymer which means they are flexible, light and strong. Our Ultra Platinum Glue took two years to perfect guaranteeing an incredibly long lasting bond. Available in 4 curl shapes, 8 lengths and 5 thicknesses there is an eye lash made just for you!